Shawn Miller is no stranger to the life-changing impact that a highly-skilled assistance dog can provide. He grew up with a Canine Companions® dog by his side to help assist with his Muscular Dystrophy. When his first assistance dog retired, Shawn was partnered with Service Dog Melissa. This new match is Canine Companions’ 6,000th graduate team. At age 6, Shawn was diagnosed with Duchenne Muscular Dystrophy, a progressive muscle disease. After meeting a Canine Companions for Independence assistance dog team, Shawn’s family knew they needed to apply for a dog and were later matched with assistance dog Eli. 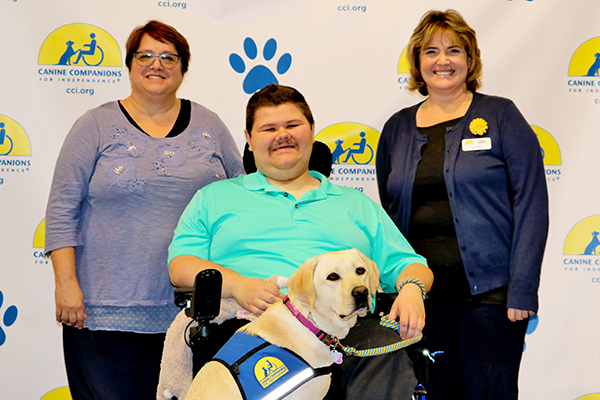 After Eli’s retirement, Shawn, now 20, knew he would benefit from the specialized skills that a Canine Companions service dog would provide as his disease progresses. In November, Shawn and Service Dog Melissa graduated along with 54 other Canine Companions’ assistance dog teams. Melissa was trained by Canine Companions certified training staff in over 40 commands to enhance independence, including retrieving dropped items, opening doors, turning on lights and much more. Since 1975, Canine Companions has provided expertly-trained assistance dogs and ongoing support for children, veterans and adults with disabilities entirely free of charge. You can help give a dog a job. Learn more at cci.org.